LUTZ, Fla. — The rainy weather may make you want to stay home, watch a movie and order a pizza. But if you called Westshore Pizza in Lutz last Thursday night, you would have found the place closed. 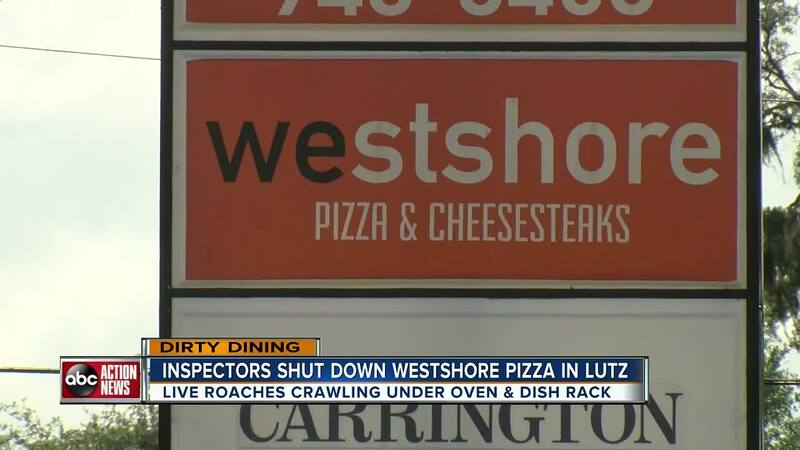 In a special Dirty Dining report, ABC Action News uncovered on May 10, inspectors shut down the Westshore Pizza at 24020 State Road 54 for 21 hours after seeing live roaches crawling from under the oven and clean dish rack. The state also saw dead roaches near the coolers, oven and front cabinets. Among the other 39 violations found inside the kitchen last week? Ricotta cheese, luncheon meats, sauce, and shredded cheese all opened and held more than 24 hours without marked with a date so workers may not know how old the food is. Employees had no proof of required state approved training. Inspectors saw an accumulation of old food debris/grease/soil residue on the hood filters, ceiling tiles/vents, floors throughout, in food storage containers, the interior of the microwave and reach in cooler, spice containers, mixer head, slicer blade and vegetable chopper. The state also documented bottles of soda stored on the floor, a hole in the wall, and the hand wash sink not accessible for employees to use due to items stored in the sink. ABC Action News anchor Wendy Ryan spoke to the owner Bryan Mariea. He said he fixed the violations immediately and addressed the roach problem right away. Mariea also said he just bought the restaurant a few months ago and its been a learning experience. But he welcomes anyone into his kitchen and promises this will not happen again.